The Philippines is an archipelago of 7,100 islands with a total land area of about 300,000 square kilometers. It lies in the Pacific Ocean off the coast of Southeast Asia. The two largest islands are Luzon in the north and Mindanao in the south. There is a cluster of islands in between them, collectively called the Visayas. The country is divided into 16 regions: Regions I–XII, the National Capital Region (NCR), the Cordillera Administrative Region (CAR), the Autonomous Region of Muslim Mindanao (ARMM), and Caraga (Region XIII). These regions are composed of 78 provinces, 82 cities, 1525 municipalities, and 41,940 villages or barangays. Manila is the capital city located near the south of Luzon, and is part of the NCR. This is the biggest urban center in the country. Marin, M.L. (2002). HIV/AIDS Knows No Borders: Addressing HIV Vulnerability of Overseas Filipino Workers (OFWs). 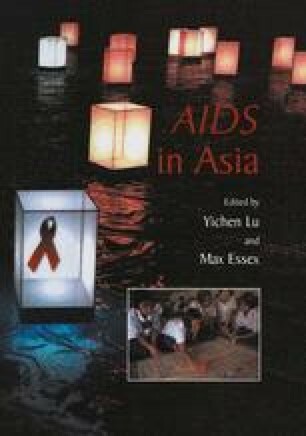 KALAYAAN/CARAM-Asia, www.phssa.org/pubs/nchssl/hiv.htm (accessed January 30, 2004 ). National Demographic and Health Survey (NDHS). www.census.gov.ph/hhld/ndhs9803.html. NHSSS (2001). www.usaid-ph.gov/documents/2001(accessed Jan. 25, 2004). Philippine Health Statistics (1997). www.nationamaster.com/country/rp/health/ (accessed Jan. 25, 2004).